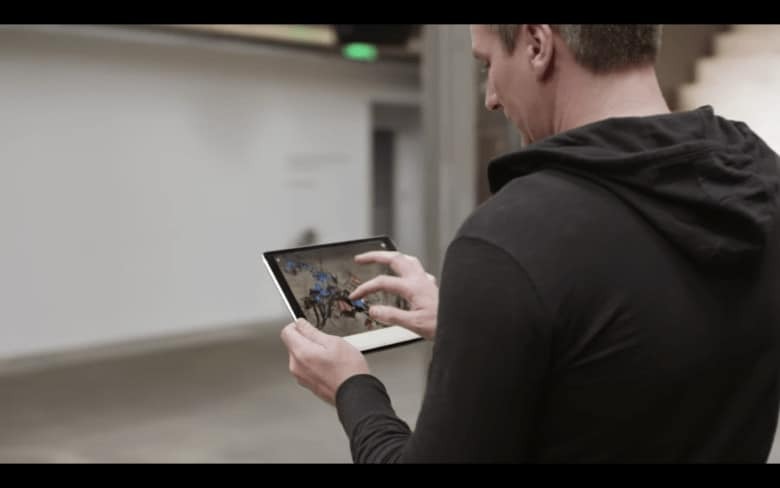 Adobe announced their new authoring tool for AR, called Project Aero. Hot off the heels of Apple’s announcement of ARKit 2.0, creative software giant Adobe revealed its own foray into augmented reality. Soon many more people should be able to create 3D, animated content that seems to float in the real world. Project Aero is Adobe’s aptly named tool for authoring augmented reality content. It brings together familiar tools with new formats and standards, living among familiar Adobe apps like Photoshop CC and Dimension CC. Announced at yesterday’s WWDC by Adobe CTO Abhay Parasnis, Project Aero features key integrations with ARKit, including the ability to export in USDZ, a format developed in collaboration with Apple and Pixar. Adobe’s demo shows the graphic elements of a butterfly-laden AR installation tossed between Photoshop and Dimension. After tweaking hue and other features, it’s exported and tested in physical space on an iPad. Then, the designer sends it to the phone of a friend, who giddily tests the content over his coffee. The idea is to standardize AR as a creative medium. Cupertino is pushing to make AR content easy to develop, share and consume on Apple devices. Adobe wants creating AR to be as straightforward as editing a standard digital photo or video. “Despite being a new medium, AR relies on the same assets that creatives have always produced such as images, video and 3D content. And the same skills they’ve developed and mastered will help propel AR into the future,” Adobe says. AR is computationally intensive. So Sensei, Adobe’s machine-learning infrastructure, apparently handles a lot of the heavy processing cycles required for these kinds of operations. Adobe promises more details in the fall at its big conference, Adobe Max. To show off the company’s vision of AR, Adobe is promoting The Festival of the Impossible at the Minnesota Street Project, a San Francisco gallery. Running from today until June 10, the festival features AR installations by 15 artists. This marks another step forward for a growing medium, increasingly supported by mainstream devices and software companies alike. Adobe cites projections of nearly a billion AR-enabled phones entering the market as evidence that this is the next disruptive platform. “Every business group across Adobe is thinking about and building for this new immersive design medium,” says Parasnis. Along with Apple, tech giants like Facebook and Microsoft are also taking long steps into the AR space. So we can expect an explosion of AR content as tools and standards grow more ubiquitous, interconnected and accessible.